After a break last week for General Conference, I resumed my weekly adventures this week with a trip to the San Rafael Swell. I'm in a canyoneering class at BYU, and we had a field trip to south central Utah on Thursday and Friday to do a couple of canyons. We left Thursday morning, did Ding and Dang Canyons, visited Goblin Valley State Park, and camped in the desert that night. On Friday we woke up early and did Baptist Draw/Chute Canyon and then spent the rest of the afternoon driving back to Provo. Southern Utah is a unique place: it's a dry, barren desert, but the scenery is incredible. 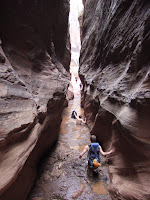 The canyons that we went through are red rock sandstone that has been eroded over the centuries by occasional flash floods. The water carves out holes in the canyons that sometimes fill with water. If they're in a narrow section, there's often no way to get past them other than wading or swimming through them. 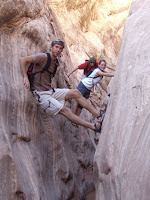 The rest of the time in the canyon is spent hiking, climbing, or rappelling. We left Provo around 9:30a.m. on Thursday and arrived at the trailhead (if you can call it that) to Ding and Dang Canyons a little after 1p.m. After eating lunch and getting our things together, we set off toward the canyon around 1:40. We spent about 25 minutes on a sunny, flat trail that follows some sandstone cliffs to the mouth of Ding Canyon. Ding Canyon is a beautiful, fairly easy hike. We passed one pool of water, but the canyon was almost completely dry. After about 40 minutes of hiking we reached the top of the canyon and hiked for 15 minutes over to the top of Dang Canyon to start back on our loop. The second canyon was a little more challenging, requiring bridging over a couple sections and a bit of pretty easy downclimbing. There were no rappels, and we stayed out of the water the whole time. We exited the canyon around 3:50 and completed our loop back to the van around 4:30. On Thursday night we drove to where we would start our hike to Baptist Draw the next morning. We left the freeway and traveled down increasingly smaller and bumpier dirt roads until we reached a "cowboy camp" out in the middle of the desert. After cooking dinner (spaghetti and bread on a stick), we sat around the campfire and talked. We all went to bed around 9pm and got a good night's sleep. 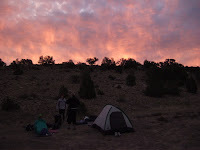 Brian woke us up the next morning with a rousing rendition of the Cougar Fight Song, and we arose to an amazing flaming pink-and-blue sky. After a quick breakfast (breakfast burritos) and cleaning up camp, we headed off toward Baptist Draw. We left camp around 8:40 and hiked a little over two miles to our entrance point, entering the canyon around 9:30. There were three easy rappels in the canyon (the longest about 80 feet) and several pools of muddy water that we had to wade through. The pools became progressively deeper as we went through the canyon. It almost would have been better if the deepest pool was first so that we could just get getting wet over with at the beginning and not have to worry about trying to stay dry. After we neared the end of a section of pools we thought that the canyon would be dry for the rest of the way. It was for a little while, but then we came to a filthy, smelly pool with wood and juniper berries floating in it that was worse than any that we had been through before. We descended a hand line down one section and then stemmed across a pool. Brian slipped on a muddy spot of rock there and ended up falling into the water up to his neck. Later, when we came to the last big pool, he assumed that it would be a waist-deep wade like the others. As he waded further in, the water rose past his legs, past his waist, and up to his chest. It was too late to put on his wetsuit, so he just swam to the other end. He shivered for the next hour while the rest of us put on our wetsuits and swam across. I had a great time on the field trip, and I'm sure I'll be back to do another canyon soon. I took my GPS along on the trip and recorded our route. You can view our tracks through the canyons in Google Earth. So... when you're wading... aren't you concerned about snakes or other scary water creatures? Besides, it's too cold down in the shady canyons for snakes to do very well. They like the sunnier spots on the surface. Did you see any snakes on this trip? No snakes. We did see a herd of wild horses, though. Better than snakes (way better). Great pictures of our great trip! Thanks posting these.